Berkshire Hathaway Inc. (NYSE:BRK-A)(NYSE:BRK-B) has made for one of the great investments of all time. Under legendary investor and CEO Warren Buffett, maybe no other company has created as many billionaires as Berkshire. One of Buffett's best investments has been American Express Company (NYSE:AXP), which has been a staple holding in Berkshire's portfolio for decades. Berkshire owns 17.5% of the company, worth about $15.4 billion. That's a nearly 12-fold increase in value from the $1.29 billion Berkshire paid. And it gets even better: Berkshire collects over $212 million in dividends from American Express each year, an incredible 16.5% yield on Berkshire's cost basis for its American Express investment. Still, which is the better investment now? On one hand, there's the highly diversified cash cow that is Berkshire, while on the other, you have AmEx's highly profitable -- but also more leveraged -- business with incredible growth prospects. Frankly, there's a good case to be made for both companies today, but it really depends on what you -- the person who'll own the stock -- are looking for. If you're more interested in a company that's built to ride out any economic condition and limit your downside risks, Berkshire wins. But if you're willing to take on more exposure to consumer spending and economic cycles in exchange for better growth prospects, American Express comes out ahead. And that should put American Express in the "win" column for the majority of investors. Keep reading to learn why. One of the biggest challenges to comparing Berkshire and American Express is that they operate in entirely different industries. Berkshire is one of the most diversified businesses on the planet, with holdings across financial services, utilities, industrial goods, and consumer products. The vast scale and scope of its offerings make it a lower-risk holding; the cash flows from its insurance and utility subsidiaries and dividends paid by its equity holdings are substantial and largely recession-resistant. American Express, on the other hand, makes a living by extending credit to individuals and businesses, and a substantial amount of that debt -- charges on American Express cards -- is unsecured. This, along with a more leveraged balance sheet (it routinely carries more debt than cash), makes American Express a higher-risk investment than Berkshire Hathaway, particularly during weaker economic periods. 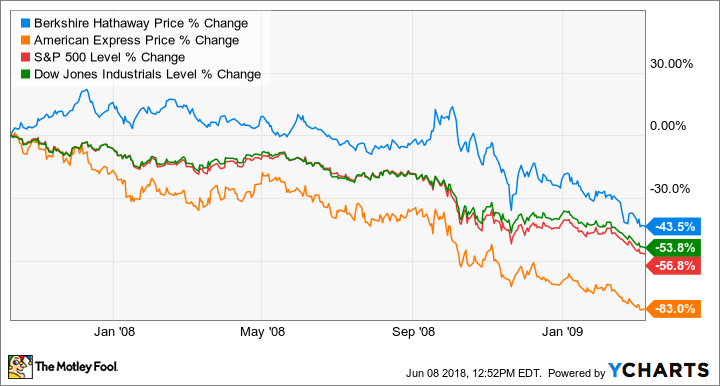 This is a "worst-case" scenario, showing how much further American Express shares fell from the 2007 peak to the 2009 bottom during the global financial crisis. Needless to say, many investors were fearing the worst for every financial institution, including Amex, which received $3.4 billion in TARP funds from the U.S. federal government in January 2009. However, this risk has proved to be more perception than reality. For instance, even during the financial crisis -- the worst economic downturn in almost nine decades now -- American Express was probably further from real trouble than it seemed, and it was able to fully repay the government before the end of 2009. Yes, its profits did fall sharply from over $4 billion in 2007 to $2.1 billion in 2009, but it remained cash-flow-positive and was probably less at risk than it may have seemed. AXP Total Return Price data by YCharts. But it's one thing to think you can ride out a downturn this sharp, and another thing entirely to do it. And that's something investors must consider deeply. Which is the better deal right now? 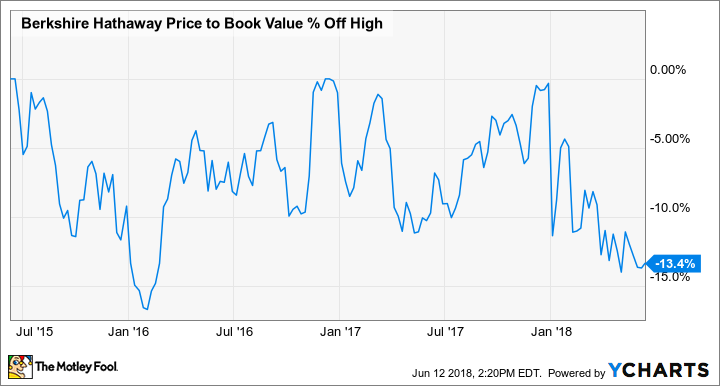 Paying less than 13 times AmEx's 2018 earnings should work out very well for long-term investors. Investors looking for more "defensive" stocks to fortify their portfolios might prefer Berkshire, and I wouldn't argue against that. 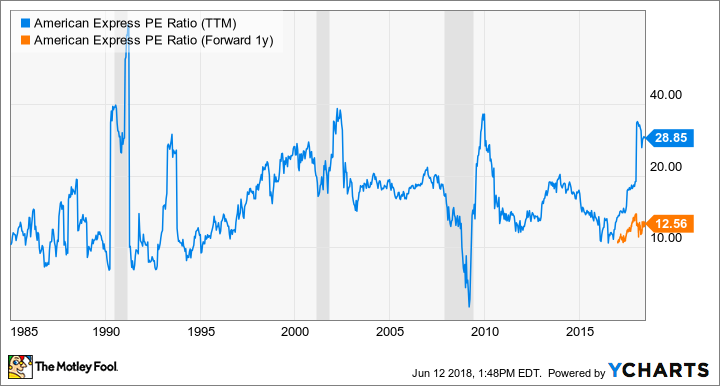 The company isn't bulletproof, but it offers some decent recession-resistance that makes it an appealing "safer" stock to buy. But when it comes to generating the most wealth over the long term, I think Berkshire will come up short versus American Express. AmEx will almost certainly be a more volatile stock to own during market downturns, but the company is primed for years of growth. 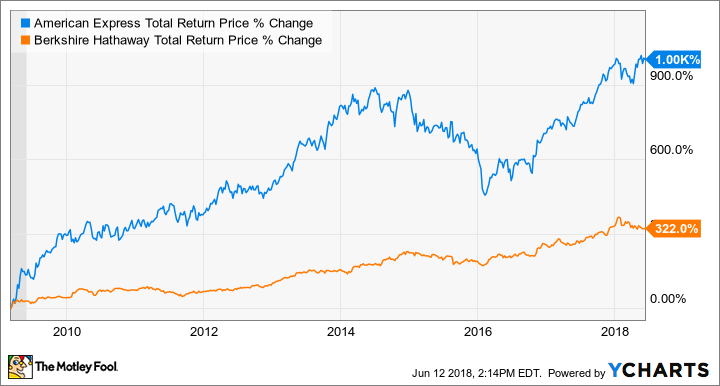 Factor in an aggressive share buyback program that's reduced the share count by 21% in the past five years and a solid history of dividend growth, and American Express is not only likely to outperform Berkshire in the years ahead, but beat the market, too.